Outside Landscape Group services the Northern Atlanta area, and can provide you with a beautiful, elegant water feature for your home. A beautiful, elegant water feature can add both significant value and curb appeal. Whether you want a formal fountain or a cascading, landscaped waterfall, Outside Landscape Group specializes in creating a variety of water features. With the sight and sound of water in the landscape, an outdoor living space can be transformed into a peaceful paradise where you can relax, unwind, and enjoy quality time with family and friends. A water feature can not only enhance your landscape and improve property value, but it can also help your health and well-being. The soothing sight and sounds of water elements will help you relax and de-stress from today’s busy world. The sound of water drowns out unwanted noise from traffic and neighbors, while the water feature creates an inviting visual focal point in the garden. 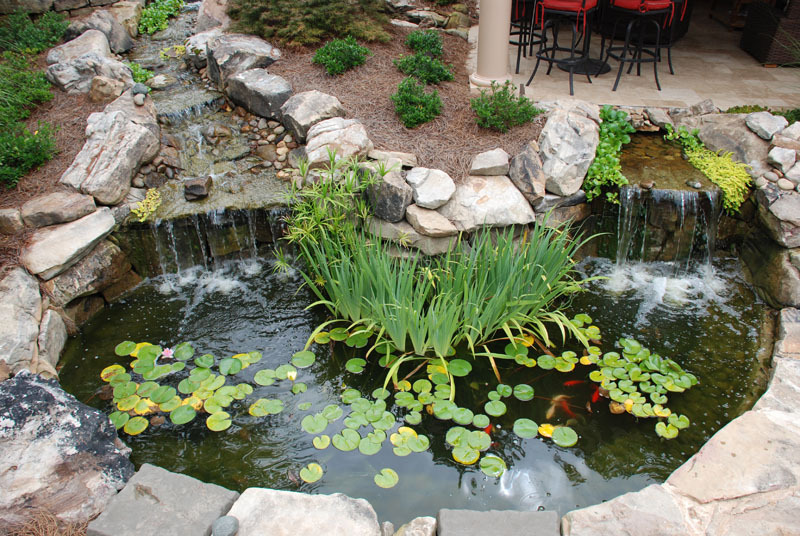 We can design a water feature customized for your lifestyle, whether you want to attract wildlife like birds and butterflies, or you want a child-friendly and safe pondless water feature. We design them to be self-sustaining, requiring very little maintenance. A water feature designed and constructed by Outside Landscape Group maintains clarity and quality of water through a balance of filtration, aeration, rocks, plants and fish. This ensures sustainability and eliminates the need for lots of chemicals and cleaning. You will be amazed how very little maintenance a water feature requires. 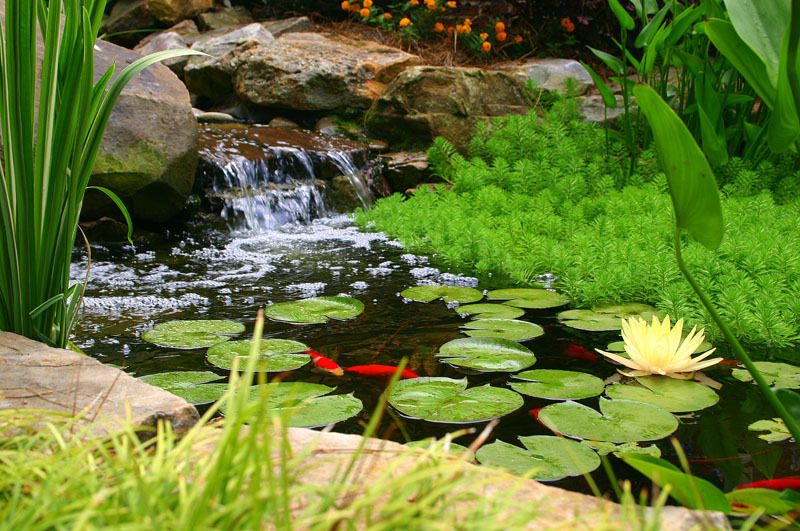 Pondless water features have become very popular for the homeowner who wants the sounds and sight of water without the pond or pool of water to manage. Without a body of water in the yard, they are also very safe for children and pets. This type of water feature is built the same way as a normal pond or fountain except the basin is filled with stone, gravel and a protected pump housing. This design creates plenty of room in the basin for water to flow and circulate without an open body of water, with the same beautiful end result. 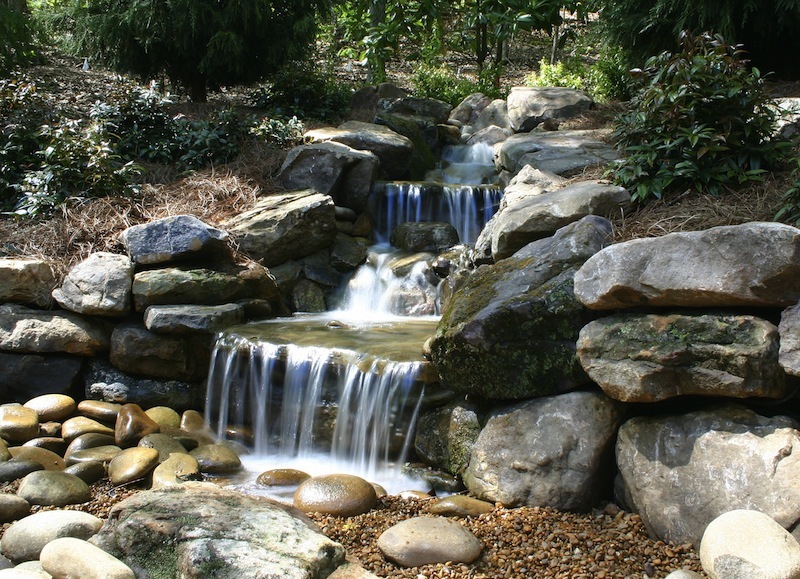 If You Want an Outdoor Waterfall or other Landscape Water Feature, Contact Us Today! No matter what style of water feature you may be interested in, whether you have a large estate or a small courtyard home, we can create a beautiful water feature to suit your lifestyle and budget. If you give us a call, we can provide you with a free, no-obligation estimate. Or contact us here to schedule your complimentary consultation.